Back to the single cylinder 650cc powerplant. 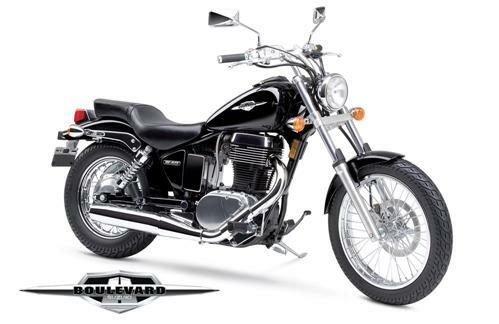 The Suzuki Savage / Boulevard S40 produces sufficient torque for city and suburban jaunts. The single 40mm carburetor keeps the bike moving until 120 km/hr at which point acceleration drops to a crawl up to 150 km/hr, if you make it to that speed. The Suzuki Savage 650 / Boulevard S40 isn’t designed for highway commuting. 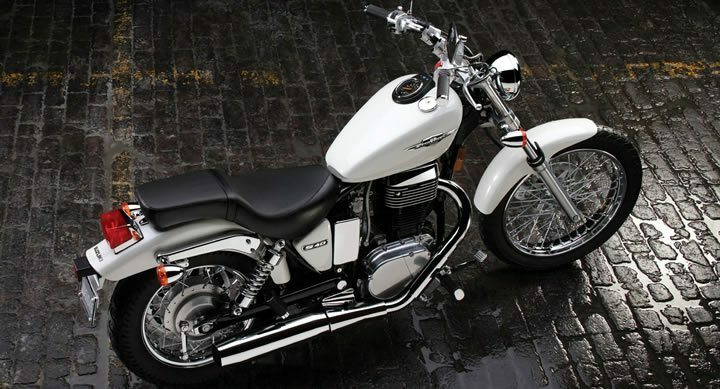 Its lightweight and low center of gravity will make it a comfortable choice for those looking for a light cruiser with a little more torque than what the 250cc japanese bikes have to offer. A throw-back to the 1980s, the Savage 650 / Boulevard S40 has kept its cost-cutting rear drum brake. This is a bike that doesn’t pretend have changed a thing, besides its name. A brand new 2012 model will still give the same strong vibrations at highway speeds as it did in 1986. Its single exhaust won’t sound any better either. The reality is the S40 doesn’t need to be anything the Savage 650 wasn’t. Suzuki has created a solid machine that one should purchase if he or she’s goal is getting into motorcycle riding on an entry level machine that’s good enough to get them from Point A to Point B. The KYMCO Venox is a 250cc cruiser that can outperform the Suzuki on the highway, although in the city the Suzuki trumps it in torque. If you’re looking for a beginner friendly cruiser, you should consider both of these machines. What did you think about our Suzuki Boulevard S40 review? Do you like yours? Leave a message in the Comments section below. The S 40 is not a two up bike for a long trip. Very uncomfortable seat. Screams at 100kph. I had one for a month and traded it for my 1100 Honda ACE. Btw it dies if you push them to hard. Good bike for a beginner. Finally, a goo accurate review of this great little bike. I put 8000 miles on mine this year. It will hit 75 mph before 90% of the cars on the road will, and that is what counts for safety. My first bike was a 1942 INDIAN Army Chief I bought when I was 14. The little S40 is light years ahead of that old beast. I have owned 2 Nortons, 3 Harley’s,4 Honda’s,3 Yamaha’s, a BSA, a Kawasaki, a Triumph 650 Bonnie, a BSA Gold Star, a Triumph 500 scrambler and an old Vespa scooter. Why slag a bike that wasn’t designed for your riding “style” whatever that may be? The S40 will outcorner your Honda 1100, it will go far more places off the beaten path, it is far easier to service and it will go a lot farther on a gallon of gas. If you need a fast bike buy a sport bike. I will agree that the S40 is not a two up bike, the rest is gibberish. I think there’s a little more to it than that… Hitting 75 mph before other cars is great, if every car on the highway came to a full stop to let you merge with them. Safety isn’t about being able to out-accelerate to 75 mph, it’s about being able to have enough power (both acceleration and braking) to quickly get out of trouble’s way, when traffic is already going 75 mph. That’s safety. It’s not about going fast, or braking fast, it’s about being to go fast or brake quickly should you need to. With so little power and a drum brake, I found the bike underwhelming on the highway. And of course it’s years ahead of your old 1942 Indian… It should be 73 years ahead! So why is it still using the same rear brake? And given that it is using the same brake as your 73 year old motorcycle is, how much thought has really been put in to safety? It’s not about quickly getting out of trouble or braking fast. It’s about situational awareness so you don’t have to brake or accelerate fast. 35 years of riding and I never encountered a situation where I have to accelerate fast to get out of trouble. Anyone who outruns his ability to stop is stupid regardless of what bike! Never been in any accident after 35 years of riding fast and slow bikes. If that were the case, motorcyclists would have 100% control of the situation 100% of the time. Sadly, there are other people on the road, and they make (often stupid) decisions too, so this is not the case. Having power or sharp braking isn’t always the answer, of course, but they are two additional tools one can use should they need to. When it comes to safety, I would rather have a tool I don’t often use than need one I don’t have. That thing looks like a toy! Ugly. A chick’s bike. NO THANKS! Ok then… So what do you ride Ronny? I think I’m gonna get one. My last three bikes were a GSF600 Bandit, DL650 V Strom, an old XV250 virago and my fav is the little V twin, the Virago. I think the S40 will be a great little around town bike that doesn’t lose it on the hills and can maybe consider passing on a 2 lane at 55-60 mph. I’ve been trying out big cruisers and find them boring as heck to ride, almost like driving a car. Little bikes make you part of the driving experience, IM(very)HO. They say it’s more fun to ride a slow bike fast than it is to ride a fast bike slow, and I think they’re right! No, thanks, I don’t really want to have to carry my toolbox everywhere I go. I’m sure Andres is right. Why would anyone buy a bike they want when they can just as easily buy a bike they don’t want at 3 times the price. I’ll leave it to him to explain that logic. Yeah, That’s why they TRAILER their bikes to Daytona and Sturgis! anyone can drive a Harley, it takes real balls to drive a smaller bike and listen to Harley BS! I’ve had one for 25000 plus miles, haven’t had to carry a tool bag, except on a three thousand mile trip and I never used it. Plenty of power for many riders, unless you want 75 mph plus for eight hours. Yes the seat isn’t brilliant, so I brought an AirHawk cover, which helps. I love it, enjoy riding it. I have an S40 2009. Haven’t yet fell in love with it. It seems very easy to service and is very torquey and strong . But : I find the seat very uncomfortable after riding for 1/2 hour. the seat design is terrible goes up at end making bottom sore .The drive belt make heaps of sounds. The gearing don’t seem very nice at top end 100 km and the bike seems to scream it head off and driving at 50km it seems to have to go in a lower gear maybe 3rd as the engine feels like it’s shuffling . If the battery would go flat id say the bike would be near impossible to crash start . The back brake is like the brakes on the 70s Suzuki’s well below efficient. My bike is second hand ,I bought it end 2013 with 5000 km owned up till now. Maybe this bike not as good as other S40 possible due to previous owner. And I’m not a full time biker nether. It would be nice too see what other people reckon? You’re right about the seat. A lot of S40/Savage owners just raise the front of the seat up 1/2 to 1 inch to make it more comfortable. I took mine apart and rebuilt it with some rigid foam that I contoured with a heat gun and a sanding disk. It raised the seating position about 1 1/2″ and also let me sit a little further back on the seat. That made it much more comfortable and gave me more leg room. I also changed the shocks for a little more travel and a smoother ride. On a bike this light, the rear drum brake is fine. Most of your stopping comes from the front. Keep an eye on those front pads, though. Mine were worn out at 7000 miles and I’ve read reports of them needing to be replaced at 5000. Luckily, they’re very easy to replace. The Savage has a very dedicated group of riders on it’s forum with a lot of good information about maintenance, repairs, and mods. Nice. All those little things add up. Did you do a write up with some pics of your seat modification? No pics, the batteries in my camera were about dead and the cell phone pics were pretty crappy. 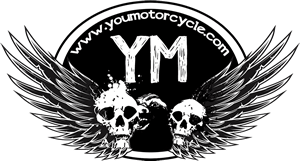 I got most of my information on the diymotorcycle site. It was also a good excuse to get new tools. You need a pneumatic stapler and some stainless steel staples to put the seat back together. It looks about the same as the stock seat but it’s a lot more comfortable. I took it apart 3 times to get it to sit the way I wanted. Have you ridden 70’s bikes to be informed on that comment about the drum brake? I rode all thru the 70’s on Honda’s and Suzuki’s. Two years of it in Hawaii when I was stationed there with the U.S. Army. One would have a tough time convincing me that a drum brake in the back is inadequate. It is, or course, not the greatest brake that could be had, but it is more than up to the task. Whether the rider is up to the task is another story. I would love to get one and go through it bobber style.Springer seat.Perhaps cut a bit off the rear fender.Im sure there could be some engine and exhaust tweaks to be found.Maybe a carburation upgrade.If these are so torquey then perhaps a belt and drive cog change could help get a better highway ride.The s40 certainly seems a good place to start my bobber project. I am going with my son to buy one tomorrow. It will be his first bike. I looked over a lot of bikes and chose this one for him. I have been riding since 1969 and my first bike was a 1942 Indian Army Chief. I have owned over a dozen different bikes so in my humble opinion I feel this S40 would be O.K. I think the little Suzuki has enough power and is light enough for a first bike. I had a Triumph 500 years ago and it had enough pep for the highway and the stats say the Suzuki should be the same. If they still made the XT500 I would tell him to get that. I really love my 2014 s40, first bike I ever bought new. Mine is blue with cream tank retro-two-tone look. I rode alot as a teen, a 1972 honda 100! I rode a yamaha 250 exciter in the 80’s and a honda 750-4 in the 80’s. I tried a kowi 750 GPZ in the 90-s. I dont like to do long hiway rides, here in Northern B.C. Canada the weather keeps me from going too far. I enjoy cruising the quieter secondary roads, and avoid rush-hour traffic. 2 of my sons have this same bike. The ride,mileage,and insurance is acceptable to us. The mechanical simplicity of this bike is very appealling. I recommend this bike to anyone who isnt brand-snob elitist. they look great. very manageable and easy-to-ride. I like that it runs quietly and smoothly. for a single cylinder bike. I got mine up to 160 kmh, once just to see if it would…and it will. not what this bike is intended for by design. It is definitely more fun to ride a small bike fast than a large fast bike slow! who needs those pesky speeding tickets anyways! I had a 650 Savage and loved it. It had a sporty exhaust and sounded great except for the backfires. I’m getting a 2013 s40 very soon. Was going to upgrade to a sporty or vulcan but heavier and I’M a small lady and not in my 20s 30 or 40s so this bike is what is going to keep me in the wind and that is what I LOVE. Keep it real and rubber side down. HAHAHA!!!! Mine backfires too. Gets a lot of attention at the gas station. I found if you use the gears to slow down the bike, it decreases the sound and sometimes the backfire happens in the shifting instead of at the gas station. I love my S40. I have owned Honda’s., Kawasaki’s, and four Harley’s, loved them all. I sold my last Harley because I felt I was getting too old to handle that big bike. I bought my S40 and have not had this much fun on a motorcycle since I was 15. It’s not only a great “beginner” bike, but it is an even better bike for us old guys that still need the “joy” of riding, but just don’t want the hassle of a 900 pound behemoth. Read your comments, realised you were talking about me, bought a 2017 blacked out S40. It attracts more attention than the Harleys I park next to at the café on Sunday morning. It takes me all the way back to the late 60s and the pure unadulterated joy of riding. When you are old enough to take the ego out of motorcycling you don’t want a half ton bike with more power than sense that handles like a camel. Try a Suzuki S40 – it will put a smile on your face. I got my 2011 R40 Suzuki 2yrs ago. It is a wonderful bike to learn on. Light, easy to control and feels good. This year I have been getting used to the highway with it. Unfortunately, I only weight 100lbs and experienced being pushed to the ditch when taking a corner on the highway on a really windy day. I find this bike is not one you want if your interested in speed, as it is comfortable up to the speed of 110 mph. I find after that it is a bit shaky. This is my experience with it anyways as a light weight. I love it cause I am only interested in riding close to home and it is easy to get used to. I do have questions for others who own one. Does your belt ever make a strange noise when you shift and does your clutch ever leak a drop of oil? Built my 97 into a chopper. Stock rear fender off, cut the back end of the frame solo seat bobbed rear fender. Fits me fine at 6 foot now. Engine mods as well. Love it! Shirley: no odd sounds from drivebelt, no oil leaks. Leaks are reported from the speedo cable next to the clutch cable entering the case. Enjoy! There are faster, but none more fun. I think that is where the drop of oil leaks from. So that is normal and ok? The belt will make a funny whiney noise when I shift IF I was riding the clut. When I hear that noise, I need to let my bike cool down, ks what I have learned. If I don’t let it cool, the clutch over heats and stops working and then I’m stuck wherever I am till it cools. So lesson I learned the hard way, is don’t ride on your clutch. But a great bike that I love love love. Love mine! It keeps up nicely with my husbands Suz Vulcan LS 900….that’s what counts. Did not want too big of a bike but needed some power. I have 2012 orange/copper 650. It does backfire when after riding and start to slow down. He wants to modify mine but I don’t like loud muffler. I’m happy the way it isn’t! Was the bike lying on its side for a while? I bought a 1999 Savage in 2013 second hand, and after 35 years on motorcycles I can say many good things. Is light, strong, and put a smile in face. Yes I raized the front of the seat 1 inch, and it works, the comfort is other. I had two troubles: battery and battery, so i’m thinking to replace for another one with more amperage. I’ve been riding motorcycles for 50 years. Sunbeam, BSA, Norton, Yamaha, Kawasaki, Harley Davidson, Triumph, Moto Guzzi, you get the idea. Most of them were large capacity bikes 900 to 1600cc. Yet I can state with confidence that the 650cc Suzuki S40 I ride now is the best of them all. Powerful enough, light enough, it puts a genuine smile on my face every time I ride. Highly recommended. Regards, David Thornley. Had a chance to buy a Yamaha 650 xs -(if I remember correctly) in 87 that was about 10 years old at the time, but needed serious work and not the most mechanic inclined person so I passed. Been kicking myself in the well not sure If I can put that here. Anyway, got married and the wife wouldn’t allow my to get a bike. Now, she is passed (almost 5 years) and I have never rode a bike before. I have looked thought all the post and It kind of 50/50. So, my question as a first time rider, would this be a good fit for a guy 6″3′. I would used it mostly for city riding only back and fourth to work, if I do get on a highway it would be short trips 5-10 miles at the most. Amy input would be appreciated. Will it do what you need? Yes. Will you feel like it’s a bit small for you? Yes. Is that necessarily a bad thing for your first bike? No. This is your first bike not your last. You haven’t mentioned your age but if this is your first bike and you’re a couple of years past your prime, a bike that veers on the smaller, lighter side, might not be the worst way to get into the motorcycle world. It’s your first bike, not necessarily your last. It sounds like you want to make a cautious, informed decision, so I’d say it’s a fine beginner bike, try it for a year or few and if you want more you can always upgrade later.